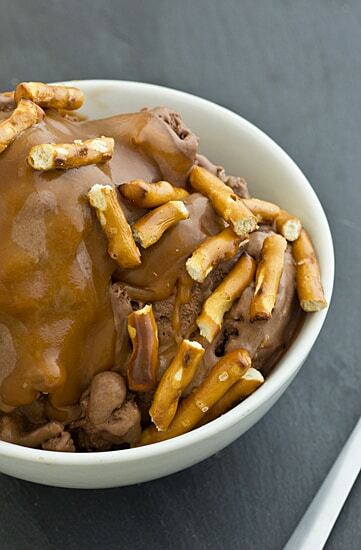 Rich chocolate gelato swirled with ribbons of caramel and pretzel pieces. Chocolate base from The Ciao Bella Book of Gelato & Sorbetto. I make something similar, it’s such a great flavor combo! YUM! We used to get ice cream at a place that had a flavor with chocolate malt ice cream, Milky Way bar pieces, and pretzels–completely random, but SO good. So this was kind of inspired by that ice cream. Are you kidding me?!?!?! What an awesome flavor combination! It was super good. Caramel makes everything taste better. This looks so good as always! I love the flavor combination, so yummy! Salty and sweet is my thing too, and pretzels are my #1 favorite snack in the entire world! I have them with me all the time, ALL the time! Delicious, and I’m going to make this one for sure! Everyone needs an ice cream maker! I’m sure there will be a lot of deals on them coming up soon since it’s almost summer, so it’s probably a good time to get one. I got mine from the Steamy Kitchen store when they had one of the $50 off $100 promos. I’m in Wake Forest, just north of Raleigh. Are you moving out of state? We are just east of Raleigh, outside Rocky Mount but we are moving to the coast this summer. Going to start looking for those ice cream maker sales! Good luck with your move! We still haven’t been to the coast yet, but I’m hoping we’ll be able to go for a long weekend soon–I’ve heard it’s beautiful there! I had gelato for the first time ever last week. It was oh SO good! SO good, right? I love the texture of it. We used to live 5 minutes from a really great gelato place and I miss it! Mmmm…..this looks heavenly. Caramel is my weakness! Love the sweet and salty tastes in your recipe! Thank you! Yes, I don’t think you can go wrong with salty and sweet–I love that combination too. Just eat it faster and it won’t get soupy. This really looks yummy. I love the salty sweet combo too. That is the most delicious-looking gelato I’ve ever seen! And the flavor combination sounds incredible. I NEED to get an ice cream maker. Stat. Thank you! Yes, you do need an ice cream maker. 😀 I have the lower-end Cuisinart one and it seems to go on sale all the time! Pretzels with chocolate is one of the happiest combinations in the world. Caramel puts it over the top. I am bookmarking this for ice cream season! (I eat ice cream in all seasons, but for some reason the machine mostly comes into use in summer.) Bummer about your freezer! Will you be getting a new one? It is SO good, especially when you make the caramel sauce too. that sounds amazing! I am not a fan of pretzels unless they are covered with something sweet! Me too. The only time I eat plain pretzels is when I have a migraine. Pretzels and saltines! Ummm…. seriously, I think I could eat the entire container in one sitting. My sister has one of those zuko makers and loves it for the kids. I wonder if you could do an alcoholic version?? I think my instruction booklet for the Zoku says something about how the popsicles don’t freeze as well with alcohol in them. So I think you’d have to make them not very boozy for it to work right. I haven’t tried it! Wow, that looks amazing! I am going to have to try this! This looks great. Do you have a suggestion or an alternative to using egg yolks? 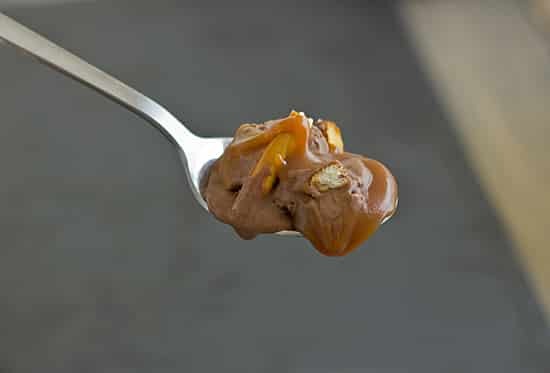 I’d look for an eggless (or vegan) chocolate ice cream recipe and then add the caramel and pretzels to that. Gelato is custard-based, so there’s really no way around using egg yolks. Sorry! Hate to be a troll but have you ever heard of a themometer? I think they cost under 10 bucks and you will never be surprised again by a lot of rotting food! a dip of 10 degrees my fridge guys says is normal when you open the door and stand there looking at it. if it is over 30 it isn’t doing a good job and should be fixed or replaced under frozen fgood is also a health hazard some things will continue to degrade at underfrozen temps. The stuff looks fattening and delicous always that’s been a downfall for me.